I love being involved in every step of a website's creation: from making sure a database table has its appropriate indexes, to every viewport looking great. Set me loose on a project and it'll be done faster than you can say WYSIWYG. Crafting information and planning for every game! Domain currently redirects to an existing project. 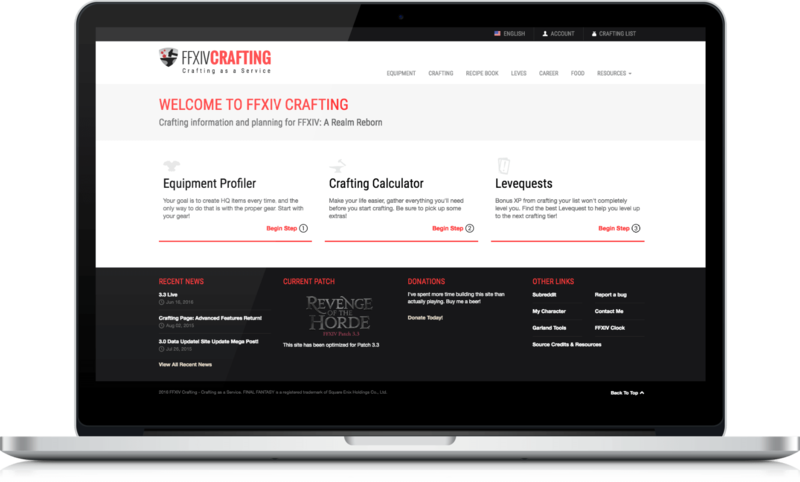 Inspired from the specificity of FFXIVCrafting.com, CaaS will offer the same type of solution, but is a broader platform to support all games. Currently in development, big plans await this project. Crafting items is a big part of the game. My tool assists others to utilize their time wisely by organizing their crafting into steps. Started in September 2013 shortly after the game's 2.0 patch. The community was very supportive and I've been updating it since. Some users claim they can't live without it. As a primary focus to drive eCommerce, I implemented a responsive design suitable for all browsers and devices, even supporting IE8 until early 2017. With a backend built on Java/SAP/CRM, interfacing with a separate team to deliver a great experience had it's own set of challenges. We could not rely on a standard backend system or framework to do things for the frontend team. 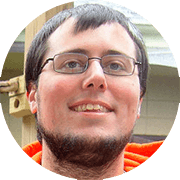 I built a lot of PHP & Linux backend customization to allow us to work on the front end. Built with Ghost.io this subdomain integrates with the primary site seamlessly. As Ghost is a node based system, it only runs on Nginx. All of our sites at the time were Apache, so I was challenged with having both running simultaneously. Interfacing with a third party (ThanxMedia) we were able to use Laravel to provide a search platform for the primary site. Like the Blog, great lengths were taken to make it look and feel the same as the primary site. A tool built to help end users find a solution to match their connectivity needs. My first big project with Legrand. Complicated MySQL queries power the formula to distinguish a cable's A and B ends, length, color, etc and present them to a user. A tool to maintain every other Legrand property mentioned above. Includes everything from CRUD interfaces to Local Network File System Mounting, and a robust ACL system for internal users. A tool for internal sales representatives to build custom cables for customers, as well as enter bids with the company's Bid Desk for approval. Saving the company an entire employee's role, it also sped up the "speed to quote" bottom line, which has had a positive impact on winning custom cable bids. Whenever the Java backend team couldn't fulfill a need, Apps stepped in. Primarily responding to Ajax calls, it also handled a pretty complicated Asset Versioning system triggered by a Git Hook whenever a pull request was closed. Still in the <table> era, email building can be grueling. I made it a little easier by implementing a Grunt system (later rewritten to Gulp) that reads Assemble/Handlebar files, then inlines any css and prettify's the result. Any complicated system absolutely requires documentation. Every system I implemented came with Documentation for my current and future coworkers. Essentially a startup, I worked directly with the Owner on a patent pending idea, I helped develop a system called Hive. Embarrassingly, the system I invented was a "roll your own" framework. You learn a lot when doing that, but in hindsight it was not a good idea. MRCSupplies was both a separate business of the Owner and a customer of the Hive system, which at its core was an eCommerce system. Likewise with the backend framework there was no visual framework (like Bootstrap). To support another piece of the Owner's business, this side project helped his reproduction graphics business get organized. A lot of work involving FTP and user permissions were involved for a customer to manage their architecture bids. Starting in 2001 I had a personal project based in Perl and MySQL. Realizing I loved developing, in 2003 I switched from a community college to ITT Tech under their Web Development program. When I graduated in 2005 I started my professional career. I jumped around every few years, occassionally taking on freelance work, and joining a startup. Could I show you examples of work from this time period? Sure, but let's face it, I hate code I built three years ago; why would I want to display code I wrote a decade ago! Even scarier: there are things I had "designed" ten years ago, *shudder*. My first passion of Full Stack begins with Back End development. I love creating things and watching them live on! Technologies that I'm awesome at!